If you’re an English speaker and you watch K-drama, you’ve probably heard of this first featured blog. It is the foremost English language K-drama website out there. It’s cleverly written, well-designed, pretty to look at, easy to navigate and chock full of personality. In my not-so-humble opinion, this is the ultimate K-drama blog. It was begun by Javabeans in 2007 when she was unable to find any K-drama sites that went beyond surface-level analysis or that intelligently discussed K-drama. 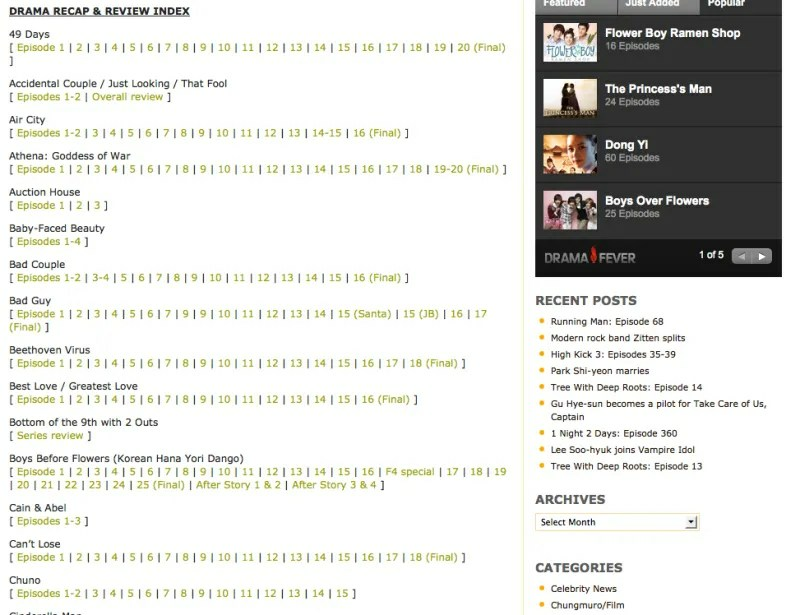 This is truly where Dramabeans shines for me, and I’m sure, for all of its fans. Before I stumbled upon this site, I hadn’t really watched ANY television or film and thought about it in any sort of deeper fashion. I knew that it was possible, but it never interested me. I was a “watch and go” sort of person. The only think I thought about in any capacity was the original soundtrack because I am a musician. But, Dramabeans brought me out of that narrow-minded way of thinking. I thank Javabeans, and Girlfriday, Javabeans‘ left-hand-woman, for that. They are quite the formidable K-drama blogging pair. They love K-drama for the reasons like the rest of us do: addictive story lines, pretty people, the Cute, seeing a guy get his girl, seeing a girl get her guy, pretty boys, the sometime levity and sometime gravity, the clever writing, pretty Park Shi-hoo, and for the sheer entertainment value they provide. But Javabeans and Girlfriday make K-drama more than just that. English-speaking K-drama fans from all over the world gather on Dramabeans to read their astute analyses of favorite shows, enjoy witty (and often delightfully sarcastic) writing styles, and to learn more about Korean culture and language. I’ll often learn something new about Korean culture or language and re-watch a show with new insight. Dialogue, decisions made, actions taken and even shoot locations are brought into new light and make me appreciate K-drama (and Dramabeans ladies) even more. And what a huge list of components Dramabeans covers, which include things such as celebrity, drama and film news, drama and film recaps and reviews, pop culture and society insights and more. As if this all wasn’t awesome enough, Dramabeans has guest bloggers who cover things that Javabeans and Girlfriday can’t get to. These bloggers (Samsooki, Thundie, DaheeFanel, redpill, Headsno2 and more) are intelligent, provide unique views on whatever subject they’re covering and add to the already high-quality of this blog. In October, they hit 5,000 posts on their blog. WOW! 5,000 posts dedicated to K-entertainment. *drool* They were also invited as a part of Dramafever’s guest panel in the 2010 New York Comicon. These ladies represented! w00t! These ladies have an insane amount of K-drama knowledge crammed into their brains. I can’t believe how much they know about actors, PDs, writers, and everything that goes into the production of K-drama (and K-everything). What’s makes it even better is that they share. Because they care. I stumbled across Dramabeans while watching my first K-drama, You’re Beautiful. I’ve always been interested in language and culture and I was really curious about the relationship between Go Mi-nam and Kang Shin-woo. What was this “hyung” word that he kept referring to and WHY was it so important that she call him or not call him that? In a random search I found a recap and began to read. I admit, the number one draw was the sarcasm. But as I continued to read, I began to see all sorts of small cultural and language bits that I’d missed before. Each recap that I read made the drama clearer because I was learning about Korean thought in general. I actually didn’t bookmark the site right away. As soon as I finished the You’re Beautiful recaps, I forgot about Dramabeans *gasp* and went off to watch Mary Stayed Out All Night because of Jang Geun-suk (who played Kang Mu-gyul). Again, I didn’t understand certain things. Why did Wi Mae-ri (Moon Geun-young) turn away while drinking soju? Was she afraid to spill it on the table? Why did Mu-gyul’s age matter? What was this speech gait/cadence difference between Mu-gyul and Mae-ri? Because I’m a musician I actually noticed that Mae-ri’s speech patterns were really different in sound than Mu-gyul’s. They matched the way that Byun Jung-in (Kim Jae-wook) spoke. The first thing I thought was that it was a dialect difference. Then I went searching. Again, up popped Dramabeans. I began to read the recaps and wouldn’t you know, all my questions were answered and more. I learned a bit about Korean family, proper drinking etiquette, and Jondaemal/Banmal. As the language nut I am, I immediately began scouring the site and discovered that juicy tidbits were scattered everywhere. I saw that everything was well-written and easy to find. Usually, if a site isn’t easily navigable, I’m gone. I’m not wasting my time on it unless I have to pay a bill for Verizon. No, wait. Then I just pick up the phone. I don’t deal with crappy navigation. I saw there was more info on Jang Geun-suk. And even now that I know more about his queer little ways, I still love the kid. I promise, noona will give you a proper haircut if we ever meet. Then I began to lurk. I started reading and watching…and watching…and watching. I found better streaming sites. I discovered other blogs. There were tons of people all over the WORLD that were interested in K-drama. (I’m a travel/language/culture-a-holic. Anything different from me, I want to learn.) There were people who loved it for reasons similar to mine and for reasons I hadn’t even thought to explore. I lurked. And lurked. And continued to lurk. Finally, I commented. Now I have friends who I regularly interact with. I have a special Unni, many dongsaengs and fellow junkies. I’m really grateful for that. My friends and family think I’m nuts. Even my sister, who occasionally indulges me, thinks I’m nuts. And I am nuts. So nuts in fact, that Dramabeans inspired me to start my own blog. At first it was because everything was so well-written that I wanted to dust off my writing chops and just get some words out of my head and onto paper (er, figuratively.) Then I figured I’d try writing a tad about K-drama. Then something happened and my site is what you see today. A lovely dichotomy of life ranting and K-drama raving (heavy on the music). It’s only been 3 months, but I’m slowly finding my voice in K-drama blog land. I owe that to Dramabeans. Thanks Javabeans and Girlfriday. Your blog is my ‘i lub you‘. Hello readers of Raine’s blog! Here I am to give my (unwanted?) two cents on the topic at hand. I looove me a good butting in, especially if I’m the one doing it. The name is practically synonymous with K-dramas, at least for us English-subtitle-dependent addicts. As Samsooki mentioned in one of his posts, they’re like the designer brand shop of K-drama blogging. They literally are the Hallyu Effect for the Western world. How many people has the Korean wave reached due to this site? It really is awe-inspiring, their dedication, creativity and success. I found the site during the phase II of my K-drama addiction. I’d watched a few of the dramas in the most-popular category of drama-streaming websites and was thinking about branching out and watching other works by the actors that had caught my eye. I started browsing and found Marry Me, Mary. I couldn’t find it on Youtube. (I used to think anything could be found on Youtube. Ah, the days of my folly.) So I googled it. At the bottom of the screen, in the ‘related search terms’ box, I found the word recap attached to my search. Curious, I clicked and LO! I stumbled upon RECAPS. I was blown away by how fun they were to read and how they seemed to capture the essence of the drama so perfectly. The LOL moments, the OMO moments, everything so perfectly preserved! It was like I didn’t need to watch the drama, I could just read recaps all day! Plus it’d be faster too! I read the recaps for the first couple episodes of Mary Me, Marry on Ockoala, but wanted a more detailed narrative. I found Dramabeans. I loved this site like no other. It was like a treasure chest I’d accidentally happened upon filled with a seemingly unlimited supply of goodies. Here, I had a ‘link’ to the K-drama world I’d previously felt a separate entity from. Reading their recaps, I sated my hunger for raving about the pretty actors/actresses and the squeal-inducing situations. I started to recognize famous names. (They all seemed so hard to remember before that). I learned about the inner workings of the K-drama. Instead of a collage of disconnected productions, they became a complex web of a single industry. Another thing I loved was how Dramabeans educated me about the Korean culture. There were plenty of ‘Aha! So that’s why…’ moments where I’d read their recaps and suddenly realize a side of the situation I’d previously been oblivious to. It was eye-opening and terribly addictive. I especially loved their Korean Pop Culture posts, where I finally understood the power of the word “oppa”, the significance of the well-known drama tropes (like the piggyback rides! ), etc. I wish they’d do more of those posts. Most of all, though, I admired their ability to put into definite words the feeling of satisfaction or dissatisfaction most viewers feel at the end of an episode. They (Javabeans and Girlfriday), like the experts they were, confidently dissected the episode and pointed out the source of the problem, making us fools think to ourselves, ‘Yeah! So THAT’S the reason I too am feeling bored/frustrated’. Loved reading their little snarky inputs peppered throughout the text. At times, they were more interesting than the drama itself (the Shining Inheritance recaps). One thing though, that I will say, at the risk of me sounding jealous, which I guess I am a little, is that they’ve monopolized the drama blogging scene. It makes thinking about seriously recapping a series seem irrelevant, since anyone who wants to read a recap will undoubtedly head over to Dramabeans central. But you know what? They deserve it. They are the real pioneers, and I truly respect them for that. Thank you, Dramabeans for being awesome and giving your time. Here is my small tribute to you and hopefully it will bring more people to your amazing blog! Let me read your testimonial to Dramabeans. Okay I did comment once before, but apparently it did not go through. Pisses me off because it was a long comment. LOVED IT! That was my reaction. Once again a well written. If this is “dusting off” your writing chops then I can’t wait to see what your “chops” are going to be like in their prime. How did I find DB? Well I couldn’t get past episode 5 of Boys over Flowers. I loved the Japanese version, but didn’t like the Korean one. So then I searched and found DB which had recapped all of BOF by that time. My DBing didn’t stop there. I used the site for the recaps on SKKS, Bay Guy, Tamra the Island, and what not. Unlike you RCU I did not have any real intellectual motivation. I just 1) couldn’t bear until the next episode got subbed or 2) couldn’t stand watching anymore. I preferred reading their recaps most of the time. Nice. We all visit for similar reasons but their different enough where I feel enlightened by how many ways people come to be connected! Hey! just wanted to tell you that I put up the Thank You post!!! Take a look! One last thing. I re-read my part. Could you add a ‘though’ after the ‘Most of all’ in the second-last paragraph? Done! And it is pretty awesome. They’re incorporating more wonderful bloggers and taking on more themselves. I dunno how they do it. I have trouble with 4 posts a week. YAY! You covered everything! EVERYTHING! I thought about everything and just the staggering amount of attention-worthy stuff on that site intimidated me. You are a very comprehensive writer, my blogging chingu! You better get a nook on their site soon, missy. I love most of the stuff she puts up there. Except for this one British punk band. Realllly not into that. But thank you so much for contributing. It really fleshed out the post and the stark contrast in writing styles plus the similarity in stories makes for a fun read I think. I tried to get as much in as I could. Even now, I just added another link in here. Just SOO much that they do. It’s quite incredible.